Camp Bow Wow Naples dog training services are specially designed to enrich your pup. Our premier dog training services offer flexible programs for every dog. The training methods we use are designed using only reward-based techniques to ensure your pup has the most fun learning experience. Our programs are exciting, effective, and enrich canines of all ages and behavior levels. One of our Camp Bow Wow Certified Trainers will work to design a program that meets your needs and your schedule. Contact Camp Bow Wow at (239) 352-2275 to schedule a session! Camp Bow Wow Naples offers several options for our canine training. Our Certified Trainers can work with your dog while they attend Camp, spending one-on-one time with them. We can also provide training services working with you and your dog in a private setting if that’s most comfortable for you. These sessions can help your pup overcome behavior issues or provide enrichment. 6 week class. Prerequisite of Level 1. Age appropriate vaccinations required. This class teaches advanced behaviors like heel, place, and distractions. 30 minute sessions to work on specific behaviors requested by the owner while the dog is at Camp either boarding or for daycare. Session prices are in addition to Day and Overnight Camp rates. Campers attending in-Camp training must first pass our initial interview process. 1-hr training session with you and your dog. 30 minute sessions 1-on-1 playing with some of the Agility Obstacles. Dogs will learn how to run through tunnels, go over jumps, go through the weave poles and more! This is not competition style Agility, and will focus mostly on having fun in an engaging and challenging way. 30 minute sessions 1-on-1 challenging your dog’s intellect. Your dog will play 2 games during this session, designed to make your dog think outside the box. 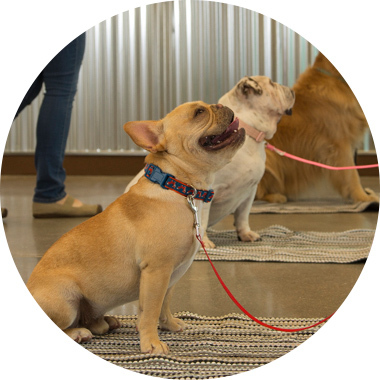 Classes change frequently to accommodate the dogs that participate on a consistent basis. 30 minute sessions that focus mainly on Basic Obedience and Loose Leash Walking. There are 2-3 dogs with 2-3 trainers training at the same time. Dogs learn how to work around other dogs, for other people, and be challenged to proof their basic obedience skills. We also add a few fun behaviors in there that reinforce the basic obedience behaviors. 1 hour group meet-up to work on dog’s walking and obedience skills with owner in an off-site public environment.